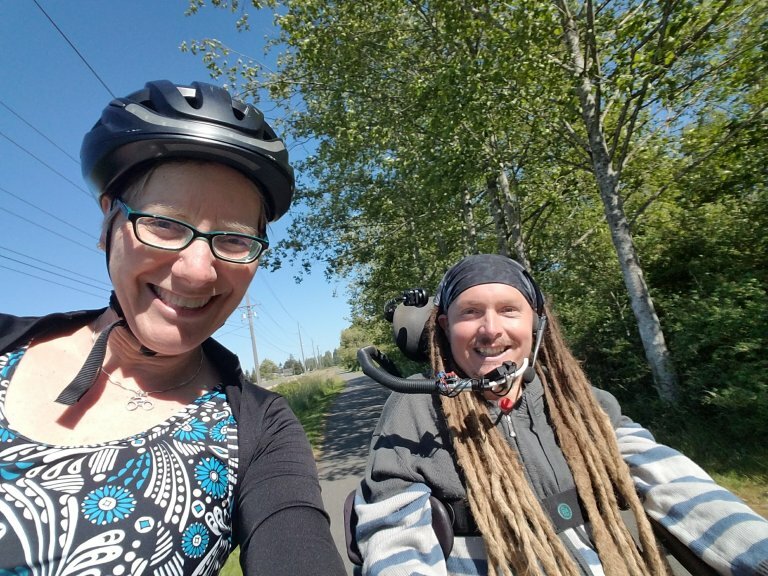 Fun moment on our 2018 spring bike touring vacation: Having Ian Mackay roll out to meet us on the Olympic Discovery Trail. The goal of bicycling in every county in Washington state gives me one thing to shoot for. As I wrote that post I realized how often my clearest memory of biking in a particular county is tied to its trails. So why not set an additional goal — one I hope takes a lot longer because I expect the state’s trail networks to keep growing and growing until they all connect — of riding every named trail in the state? Every trail-ish, that is. Trail segment name has to be officially recognized by some agency. Paved trails only unless I choose to include a gravel or soft-surface trail suitable for biking without having to go to a fat bike (although what an awesome excuse to check out a fat bike at long last). I’ve been talking for a while about getting a bike that would serve for gravel/touring/commuting…. “Riding” means riding enough of it to have a sense of what the trail feels like, not just tires to ground in the trailhead and off to the next one. It doesn’t necessarily mean I rode the entire length so I may need to go back. Trail needs to be at least a mile long, or if it’s shorter it’s the beginning of a planned longer trail. TrailLink, created by the good folks at Rails to Trails Conservancy, provided a robust starting point for this list. Their interface and app let you sort by activities and trail surface as well as location. It doesn’t list every trail in the state, though, so I did some additional searching. Another useful list of Pacific NW trails curated by Dan Crawford gave me some more. And for the last five and a half years I’ve worked with bike and trail advocates from around the state so I have great news items showing up in my social media feeds on a regular basis. 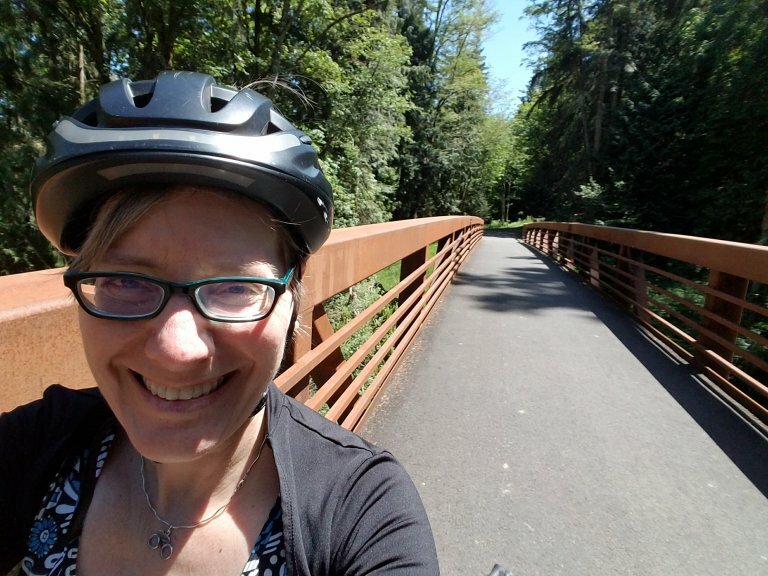 Below is a first run at my Washington trails #BikeIt list. As with my #BikeIt list for riding in every county in Washington state, I’m using boldface to indicate those I’ve already ridden. Some links go to maps or information on the TrailLink site, which is handy for the reviews people post. Some go to a site maintained by a Friends of This Trail group, a news article with some interesting information, or my own post about riding a particular trail. I’ve included a location in parentheses where that isn’t part of the trail name. You’ll also find a list of bike maps linked on the WSDOT site. Some trails are being developed in segments that result in multiple listings for the same trail name, different chunks. Imagine when these all connect! A few things you’ll notice: Washington state loves its riverwalks, greenways and rail-trails, and the state Centennial celebration resulted in more than one trail dedication. My first trail volunteer work was on the North Idaho Centennial Trail Committee working to extend the Spokane River Centennial Trail and I’m happy to have ridden both Centennial Trails in Washington. Apple Capital Recreation Loop Trail (Wenatchee and East Wenatchee): Love riding this and stopping at Pybus Market for treats pretty much every time I’m there. Slide show in my post from a 2014 visit. Ben Burr Trail (Spokane): I’m not going to boldface this one until I ride the newly paved surface and the extension to the Spokane Centennial Trail; I rode it when it was a shorter gravel segment. Here’s a bit of history. Bill Chipman Palouse Trail (Pullman): Here’s a writeup by someone who biked it a few years ago. Cross Kirkland Corridor (King County): Got to ride this one right after it opened with Cong. Suzan DelBene and tons of other happy trail promoters and bike riders who share the vision of the entire Eastside Rail Corridor. Foothills Trail (Pierce County): Hard to believe I haven’t ridden this one yet. Foothills Rails to Trails Coalition keeps it growing. Greenbelt Trail (Clarkston): This connects to the Lewiston Leve Parkway. Since I was born in Lewiston and lived there until I was about 12 I’ll be sure to ride the whole thing. Guemes Channel Trail (Anacortes): Rode just the tiniest bit of this on an old mamachan when the community held a dedication event; looking forward to going back when more of it is done. Klickitat Trail: Gravel trail, true, but lots of mileage that makes it a worthwhile ride. Liberty Lake Stateline Trail (Spokane County): Really a continuation of the Spokane Centennial Trail. Melrose Connector Trail (Seattle): OK, so this breaks me requirement for a minimum length but it really is a trail and I rode it often when I lived in NE Seattle. One of the places where at rush hour you can be pedaling above I-5 and look down at the trapped drivers below. Powerhouse Canal Pathway (Yakima): I actually may have ridden this one — trying to remember. Prairie Line Trail (Tacoma): This one’s a shorty for now but there’s more to come. SR 520 Trail (King County): Rode a bit of it before it opened thanks to my job, rode it on opening day. World’s longest floating bike/walk path! Snohomish County Centennial Trail: Trail Coalition of Snohomish County supports the expansion of the trail network. Soundview Trail (Tacoma): connects to the Grandview Trail so I could do aloop and check them both off. Spokane Iron Bridge: This is one of those ones that would be too short for my parameters but I’ve already ridden it. Plus it’s cool. Whitehorse Trail (Snohomish County): I rode only a tiny, tiny bit at an event celebrating progress toward completion; have to go back! Willapa Hills Trail: I can knock this one out if I Ride the Willapa in June. Woodland Trail (Thurston County): Had a great ride from the Amtrak station in Lacey to downtown Olympia Sept. 2018 using the Woodland Trail and Chehalis-Western. What a gorgeous experience! Wow, I’ve only ridden 45 out of the 123 that meet my criteria — 36.58%. That’s not as high a percentage of completion as my Washington counties tally. I’d better get riding. I’ll come back to update this as I cover more ground. If you have an event or excuse to ride one of the ones I haven’t yet gotten to, let me know. I share a lot of trail experiences via Twitter. Here are just a few.